This presentation poses a substance abuse treatment which acknowledges and accommodates the personal needs being addressed by substance use, bypasses perceived resistance and employs idiosyncratic psycho-biological learning to achieve a mind-body gestalt complementary to the client’s sobriety. Client self-empowerment and relapse prevention are built into the intervention. 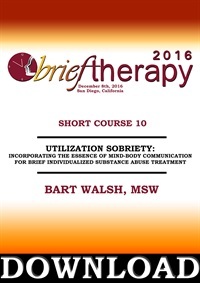 This method develops a safe framework for addressing any subsequent mental health themes directly or indirectly related to substance misuse. 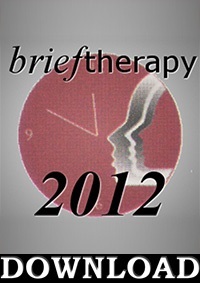 A simple form of mind-body communication known as ideomotor questioning is employed in this procedure. Because this is a new strategy, fundamental information applicable to all levels of professional experience will be provided. Addictive Behavior Topical Panel with Frank Dattilio, Esther Perel and Reid Wilson. This workshop offers medical and psychotherapy professionals an approach for the management of chronic pain conditions. Specifically intended for work with patients at risk for medication dependence techniques are taught that involve self-assessment and active participation, both integral to the healing process. The use of creative imagination and hypnotic strategies offer opportunities for the subjective perceptual alterations, which can be used in the adaptation to chronic discomfort. This presentation poses a substance abuse treatment which acknowledges and accommodates the personal needs being addressed by substance use, bypasses perceived resistance and employs idiosyncratic psycho-biological learning to achieve a body-mind gestalt complementary to the client’s sobriety. Client self empowerment and relapse prevention are built into the intervention This method develops a safe framework for addressing any subsequent mental health themes directly or indirectly related to substance misuse. Ideomotor questioning is employed as a practical conduit to body-mind communication and function. Society has lost control. Many in the culture are living in a downward spiral of a new addiction, chasing money, power, success and a wilder, faster pace of life. What is the impact on our understanding and treatment of the addicted couple and family who must live and work in a culture that is out of control? Dr. Stephanie Brown will present her new work on American culture’s addiction to FAST, and outline how all couples therapy must now include an understanding of addiction. This workshop will explore the fine line between love and addiction. 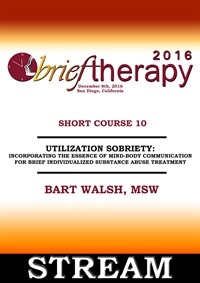 Therapeutic strategies and questions will be explored, and you will learn three predictors of compulsion/ addiction.